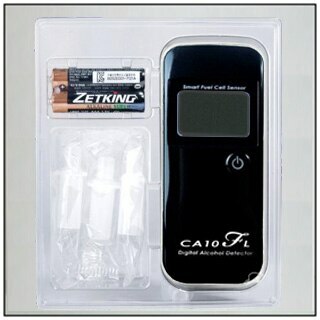 Fuel cell sensor alcohol tester is the gold standard of hand held alcohol testers for both personal and professional use. The breath is directed into a fuel cell sensor with dual platinum electrodes where alcohol oxidized and generates electrical current. By precisely measuring this current, alcohol tester gives very accurate measure. The fuel cell sensor is specific only for alcohol and does not respond to acetone, ketone or other substances which can be found in human breath. The CA10FL gives high accuracy and wide detection range up to 4.00‰. The tester is equipped with an advance temperature function to help you operate it in an optimal temperature range.